Sanchi is situated in Madhya Pradesh and is famous for an outstanding specimen of Buddhist art and architecture which belongs to the period between third century BC and twelfth century AD. Sanchi is well known for its tourist attractions starting from its most vital monument, Sanchi Stupa which is approximately 7 km from Aaram Baagh whereas Satdhara a serene hill, well known all over for its stupas, monasteries, temples and pillars is just 2 km away from Aaram Baagh and the Buddhist Complex at Satdhara is situated on the bank of the river Beas giving tourists a blissful experience on their visit to Sanchi. Built in the 3rd century, the world renowned Sanchi Stupa is a remnant of Sanchi's glorious past. Also a World Heritage Site, this stupa speaks volumes of Sanchi's rich cultural and architectural grandeur and the rich legacy of buddhist aesthetics. This stupa is intricately carved and has highly embellished walls and gateways. This monument is a true example of India's shining history. 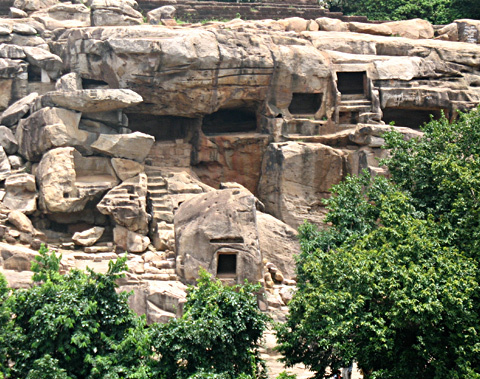 The caves of Udayagiri are an exquisite illustration of the local 'Art' form. 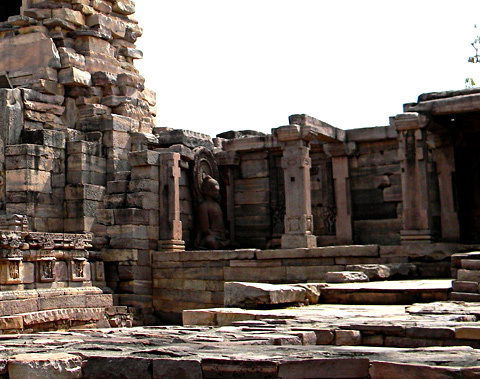 These were established by Chandragupt Vikramaditya, after defeating Shak's' in the 4th and 5th Century A.D. The primary motive behind the construction of these caves and establishment of the sculptures of different 'deities', dearly seems to be promotion of Jainism' among the common folk. There are in total twenty caves, out of which two are related to 'Jainism' and the rest eighteen to 'Hinduism' directly. On the top of the caves hill remaining of the 'Mauryan', 'Shung and 'Nag' dynasties have been found, which also include 'Buddhist’s Stupas'. 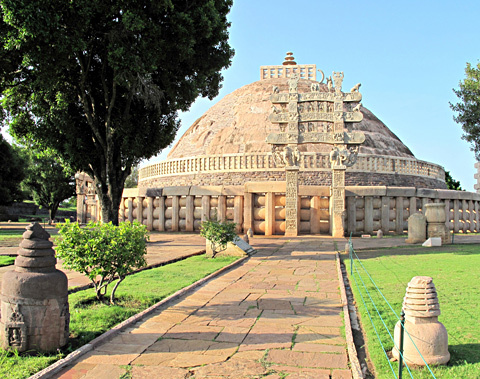 Sanchi Museum is the right place to learn more about the history of the place. The museum houses excavated objects that are over 2000 years old. Since it has a stunning collection of antique that belongs to various dynasties, you get to learn more about the lifestyle of the people belonging to various cultures. Constructed in the 5th century AD, Gupta Temple in Sanchi stands proof of the architectural excellence of the Gupta period. It also reflects the integrity that prevailed among people belonging to various faiths for the temple was constructed in a land that was predominantly a Buddhist pilgrim center. The structural beauty of the temple so captivated Sir John Marshall that he considered it one of the most logical designs. 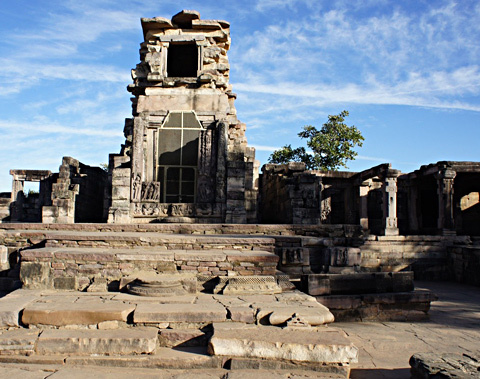 The temple is a must visit destination in Sanchi. Life of Emperor Ashoka has lots of tell to power mongers. Rarely such examples are seen in the past when an emperor as mighty as Ashoka decided to travel the path of angels by calling an end to war to conquer land. He had conveyed his message loud and clear by building pillars across his kingdom. The pillars ranged between 40 to 50 feet in height. 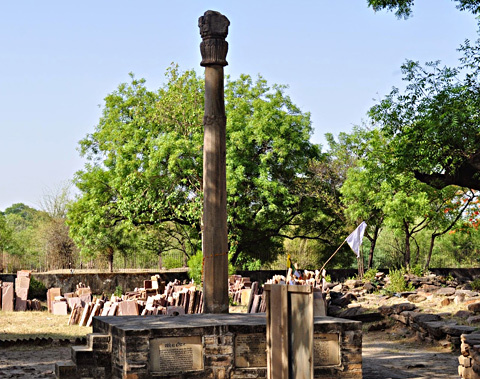 Near the southern gateway of Sanchi Stupa stands the famous Ashoka Pillar of 3rd century BC. The pillar represents elegance, creativity and exquisite architecture. Built in Greco Buddhist style, the 16.4 meter tall pillar with Four Lions had been given a stunning polish making the pillar brilliantly shine till to date.